African Market Sale — Success! 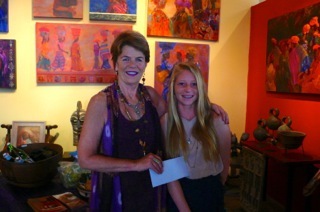 It started wonderfully when Elizabeth Doody and her family came in to present the checks for her market lamb which she sold at the Ventura County fair with the intention of donating the proceeds to the Nomad Foundation to help youth in Niger. She is a remarkable young woman and enlisted her whole family to participate in the project–with great success. She was able to present us with $2,050. There were add ons to the purchase of the lamb which amounted to almost $1,000–so thanks– to all of you who supported her project. 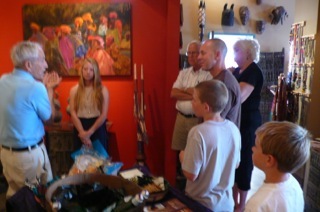 Dr. Skankey was in great form explaining our midwife project all day and we had a pretty constant stream of visitors. Purchases and donations came in at close to $2000 so now I am off to Niger with some funds to start a new well, open a new school, bring electricity to other schools and prepare seven new communities for the midwife training which will take place in November. A big THANK YOU to all of you who supported the sale. We could not keep up this work without you…and we are really getting results.